What They Say.....Physician Bess Codman has returned to her family’s Nantucket compound, Cliff House, for the first time in four years. Her great-grandparents built Cliff House almost a century before, but due to erosion, the once-grand home will soon fall into the sea. Though she’s purposefully avoided the island, Bess must now pack up the house and deal with her mother, a notorious town rabble-rouser, who refuses to leave. What I Say.....It's summer so time for me to read all things east coast and The Book of Summer was a great place to start. Bess running away from a crumbling marriage, finds herself in Nantucket trying to talk her mom out of attempting to save the family home from crumbling into the sea. 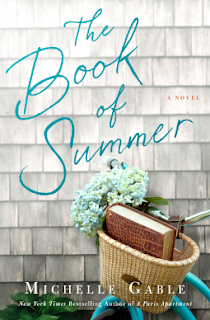 As she begins the long chore of packing the house, she finds the Book of Summer, where her relatives have entered their thoughts into the family guestbook all they way back before the second World War. I normally like books that jump back and forth in time, and I did really enjoy that about this book. However, the current timeline was a lot less interesting than the past. I never really felt that strongly about Bess or her story - her storyline with her ex was kind of vague, but awful. Her grandmother's story was much more interesting but equally awful. Living with the secrets of their times, you never really got an idea that Ruby really understood what was happening to her husband - did she not get it or did she just make peace with it? I was confused. It's getting great reviews on Goodreads!